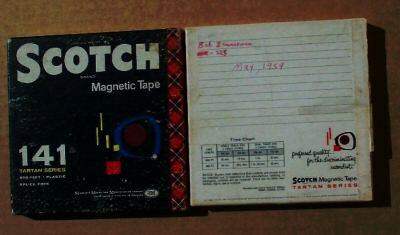 Here's some photos of tape boxes. 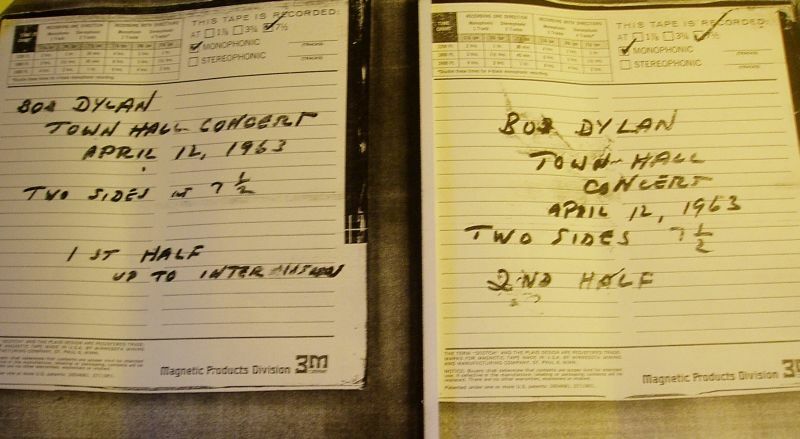 The Town Hall tape box photo came out a few years ago, before the actual recordings emerged. "Here's some details of a source recording which is known to exist. 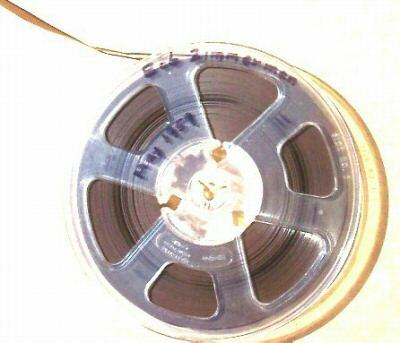 It is a 71/2 ips Mono recording, from a 'line' source, and is complete. 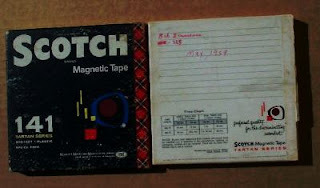 The tape has been described to me as being brittle due to their age and in need of work before it could be transferred." The other photos here are from the 'Rick Kangas' tape that was offered for auction some time ago. Ric Kangas has attempted to sell his 1959 recording of Bob Dylan via eBay, for an ambitious US $1,500,000.00 starting price! 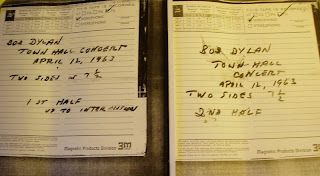 Ric names two unknown early Dylan compositions, the third of course turned up on the 'No Direction Home' soundtrack. I believe originally Kangas stated that there were twelve tracks on the recording? A. "When I Got Troubles" By Bob Dylan 1:25 min. Briefly used in the current Martin Scorsese NO DIRECTION HOME: BOB DYLAN documentary. This song is also the first song on disk one of the 2 cd soundtrack of NO DIRECTION HOME. B. "I WISH I KNEW" by Ric Kangas, backup by Bob Dylan 2:05 min. C. "TEEN LOVE SERANADE" aka "I GOT A NEW GIRL" by Bob Dylan. 2:05 min. Also briefly used in the NO DIRECTION HOME documentary. D. "THE FROG SONG" by Bob Dylan 1:10 min. Never released in any format. Bob is singing like Clarence "Frogman" Henry. This was recorded on my tape where I'd put my original songs. When Bob came over, I recorded these 4 songs and then continued to record my songs on the rest of side one. Side 2 has various popular songs recorded from radio stations in Hibbing and Duluth MN. plus more of my original songs. Total length of tape: apx 45 min. each side (aprox. 90 min total both sides). Some of the other songs are recorded at different speeds.